Songwriting, for Emily, is a meditative practice. Rather than starting with a structure or an external idea, it starts small, hidden, and is uncovered with reverent care, like a dinosaur bone. The stories have always been there, and they aren’t necessarily only hers. They’re everywhere, always, hidden in our histories, just waiting to be discovered. Through songwriting, Emily seeks to foster healing and sincere connection by writing instinctually. She writes songs that excavate shame and shine a light on the goodness and humor buried under each painful moment. In 2009, Emily Zisman released her debut album Naked Day Alone in which she unfolds little glimpses into the inner workings of her mind with unapologetic honesty. 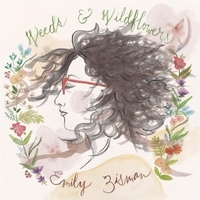 Bringing her soulful voice to folk-Americana music once again, Emily Zisman returned in 2014 with her second self-released album Weeds & Wildflowers. With her heart firmly rooted in the Bay Area, Emily is currently performing throughout California in support of this release. She is planning to release her third album in 2018 in conjunction with a tour of the Pacific Northwest in the next few months.